Eliminating the F – word | Train Positive Dog! 1. FUN – The activity must be fun – enjoyable – for both dog and handler. 2. CHOICE – The game must provide choice points for the dog – the right choice will continue the game and lead to rewards, the wrong choice will not. 3. CRITERIA – Clear criteria – rules of the game must be clear to the dog and applied consistently. 4. FAILURE – The game must provide an opportunity for the dog to fail – the game must provide challenge (of an appropriate level). Susan Garrett is an excellent trainer and I do love the way she structures training into a series of games, but I beg to differ just a bit with these four elements. Specifically, with #4 – Failure. 1. FUN – absolutely! Training should be, must be, fun for dog and handler. I have a dog because dogs bring joy into my life, because I enjoy their company; I want to enjoy what I do with them. 2. 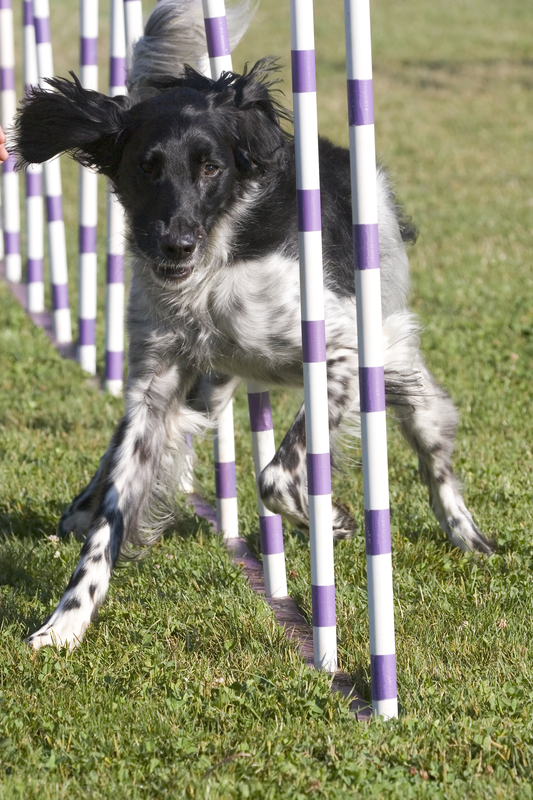 CRITERIA – Clear and consistent criteria – the rules of the game – are essential for the dog and the handler. The dog needs boundaries about what behavior is acceptable and what is not in dog-human interactions. For example, if I am going to play a tugging game with my dog, I need to define the rules about how the game starts, how and where the dog gets to grip the toy, how I will move the toy, and how the game stops. 3. CHOICE – Choice for the dog is also essential – the choice of following the rules of the game (criteria) – the choice of offering behavior that may continue the game and lead to reward (reinforcement for the right choices). Choice comes out of the criteria that are set up for the game. But there can also be room for choice in a training game that allows the dog to be creative, to offer new behaviors that the trainer can reinforce if she chooses to. 4. CHALLENGE – Training needs to present challenge to the dog if the trainer wants to increase the skills and level of response of the dog. The training game already has the element of choice, thus the element of failure is already there, I don’t have to set the dog up to fail. I will challenge the dog to perform trained skills in more distracting environments, at more distance, for longer duration, but I will do that in such a way that my dog will succeed as much as possible. I really don’t think my dog has to fail to learn the correct response. If my dog is often failing to make the right choice, I am making the game too challenging. I didn’t need to fall off my bicycle in order to learn how to ride it successfully. My dog doesn’t need to be tempted to make the wrong choice in order to learn what the right choice is. And I think that it is very easy for trainers to hear that “you need to have failure built into your training” and interpret the possibility of failure as the requirement of failure in training. Absolutely increase the level of challenge in the choices your dog has in training sessions as your dog’s skill and response increases, but keep the mindset of setting your training up for success. Start with something your dog loves to do already – perhaps fetching a ball or playing with a favorite toy. That will be the Fun. And start with a simple behavior that your dog knows – sit or down or giving eye contact. Fetching that ball or getting to play with that toy will be contingent on responding to the cue for the simple behavior. I ask for sit, dog sits, I throw ball. That will be the Criteria. (how quickly the dog has to sit, how long the dog has to sit is also part of the criteria) The dog gets to choose whether or not to sit. That will be the Choice. The correct choice continues the game with the ball or toy, the incorrect choice means the game is on hold. The Challenge will be in how difficult you make it for the dog to make the correct choice. When you start this kind of training game, make it easy for your dog to succeed. Once the dog is “in the game” , you can incrementally change the criteria to require a faster sit, or a sit at your side, or a sit while you wave the ball around, or asking for a different behavior. If you are not able to cue the dog and get a correct response 2 out of 3 cues, the choices are too hard.